Message Stefan on Twitter, Youtube, or Gmail! "Stefan Strek is my wild card endorsement this year. Of all the great candidates running for the Republican nomination of Oregon's Congressional District 4, I look forward to seeing Stefan Strek shake things up in Washington DC while representing Oregon in place of Peter Defazio!" "Stefan Strek of Eugene, 27, who works in the University of Oregon’s financial aid office. Strek ran for mayor of Eugene two years ago, and believes his ideas will have greater appeal among a more conservative electorate. Strek describes himself as a “hard-core fundamentalist” on gun-rights issues and says he admires Trump for speaking his mind. ...wants stricter drug laws and more timber-oriented forest management policies. ...elective or appointive office would serve Strek well." "Mr. Strek is a straight-shooter who can handle any heat from the fake news media. He definitely has the best chance of any Republican Candidate at beating DeFazio and if elected, will restore adherence to the Constitution in Congress." "Strek is dedicated to local Oregonians. As an independent businessman, I know Mr. Strek will work hard to lower taxes and put more jobs into the Oregon economy." "As a Conservative Woman, Stefan Strek is my top candidate. He fights for my right to self defense, everyone's right for life, and a stable, free economy." "I don't trust politicians, but I trust Stefan Strek. As a lifelong Oregonian and Woodsman I know Strek has what it takes to restore Oregon's local Timber and Fishing Industries, bringing back jobs for working-class people." 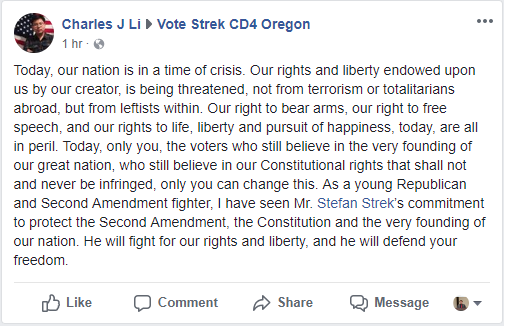 "The Strek Campaign has been Officially Endorsed by Charles J. Li, one of America's most famous young Second Amendment Rights Activists. Charles J. Li has been recently featured in several National American News Outlets for his Second Amendment Activism." School Hauls Pro Second Amendment Student in for Questioning Over Gun Flag It's Not an Actual Gun. Student Hauled in for Questioning Over 'Come and Take It' Flag. Student Questioned for 2nd Amendment Flag. California Student Questioned Over 'Come and Take It' Flag.